A giant black rectangle on our wall (not to mention the messy wires!). I was less than thrilled with how it looked, especially since our Living Room opens to the foyer and is where we end up hanging out with guests most of the time. I knew there had to be something we could do to hide it or at least dress it up a little, but when I started looking into solutions like this and this, I realized that we were looking at thousands of dollars to get the job done - ouch! So like most projects start around here, this one began with our cheapness. 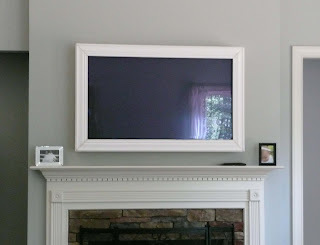 The canvas fits exactly inside the frame and just pops in to hide the TV or out so we can watch a movie or show. What do you think? I know the giant black rectangle above the fireplace is a pretty common problem, so we did document our process so we could share it -- it's fairly involved, though, so it will just have to be a post of its own (hopefully this week!). That is SO neat! I can't wait to see how it was done. Very cute idea. Can't wait to see how you did it. I love that design - was it freehand? Awesome! Will you do a tutorial? Pretty please??? What a great idea! I love it! I'm looking foward to seeing the process involved in creating this. Now THAT is a great idea!!! As a decorator, TV's are the bane of my existence. Love this creative way of disguising it. That is positively brilliant! And what a lovely painting! I am in awe of this project. Congratulations for being this month's amazingly talented person in the Nester's Nestletter for your dining room painted wallpaper. That was truly amazing and absolutely beautiful what you did to your dining room wall. Love what you did with your TV! You are so creative. Love following your blog. That is a great idea! You are so talented! How pretty! We don't have a tv in our livingroom, but we have a computer and watch some downloaded movies in there. Wires everywhere, but at least not above the fireplace. Someday, I'd like to get a tv like that above the fireplace and I do like that screen idea alot! Make sure you post how you did it! Hi Britt~you are amazing! THIS is amazing! I am loving it to pieces and shamelessly stealing this idea. Wow. This is probably the best thing I'll see all day! I can't wait to see how you did this. By the way, you totally inspired me to take a trip to the JCP outlet in Forest Park! I hadn't been in a long time and I loved it! Great deals abound there. Thanks! Genius!! I have been searching for a way to cover up the black hole above my mantel and this is just brilliant. Cute blog I am jealous of all your yard sale finds. Love the TV decor. Great idea. My husband and I were wanting to do something like this. Can't wait to see the how to! Hi Britt--just came over the Nester's newsletter--you are incredibly talented. Your dining room is gorgeous. I am so impressed. I love the frame for the TV! I can't wait to see how you did this project. You are so talented!!! Oh, I have seen that done and it looks great. That is pretty brillant...a great solution to what many people see as an eye sore! Thanks for all the comments! :) I will definitely try to get a tutorial up and running very soon! I guess I should explain a little better about how it "pops" in and out. We made the canvas to fit the inside of the frame perfectly, so it fits inside the rim of the frame snugly. This holds it in place, but also allows us to just pull the canvas out of the frame. Does that make sense? That looks amazing! I can't wait to see how you did it. The frame made it look so much better, but this is incredible. I love it! Very, very clever! I love it! I'd love to know how you accomplished this!! BRILLIANCE pure and utter BRILLIANCE!!! this looks great. cant wait to hear more. That is awesome! My problem is I have one of those "cubby" holes above my fireplace. I hate it because anything you put up there looks like a weird shrine. I'm stumped. But maybe I could just cover it with a giant canvas (I thought of a family photo, but it really is huge). Where did you find your print? It looks fantastic! 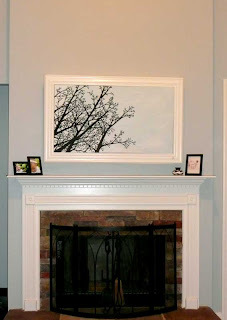 Great idea, love having artwork over the fireplace! LOVE it!!! What are stretcher frames? That looks awesome! What happened to the cords? That looks wonderful. We are remodeling and plan to put our TV on the wall, so I can't wait to see the process. I am interested in seeing how you hid the wires. Love it! This is perfect timing for me because hubby is shopping for a tv and I keep hating the way they all look (black or silver trim, yuck!). I have a question though... Does the your remote control still work even though the sensor on the tv is covered with your wood trim? Please let me know, if you have a free minute. My email is kortneinichols(at)gmail(dot)com. Thank you so much! Where did the wires go? Please share a tutorial soon! I'm getting ready to do this! I LOVE IT! I was wondering if you still like it. 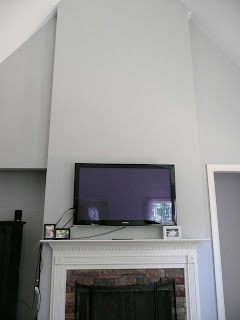 My other concern is .. is it comfortable to view your tv above the fireplace (it is kinda high)? Thanks so much for sharing this tutorial!!! looks like incredibly wall tv installation and Plasma one the most famous product now days. People are upgrading there tv with LED and LCD technology. I love it such a marvelously beautiful structural location.